Current Parents: Log in to the Parent Portal or buy textbooks or see the Program of Studies. Parents are an integral part of the partnership between home and school. Parents reinforce lessons learned in school relating not only to academic subjects, but also to character, values, and behavior. The School supports values and cultural patterns that are learned at home, endeavoring to balance the needs of individual students and families with those of the School community. Horace Mann School strives to help parents to understand and participate appropriately in the educational experience of their children. The commitment to parent education begins in the admissions process and continues with mailings and electronic communications, workshops, and activities in each division. These initiatives contribute to smooth transition for students and families at entry levels and between divisions. Once children are enrolled, parents are kept informed of their child’s progress through conferences and reports, and informational evenings and orientation sessions introduce parents to administrators, faculty and staff. Various grade-level programs help families to understand the School’s expectations of students and families. 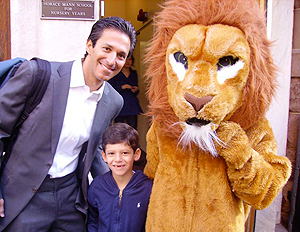 The organization through which parents contribute to the life of the School is the Horace Mann Parents Association. All parents and/or guardians of current Horace Mann students are members of the HMPA.